Sebastian Barry talks about his acclaimed new novel Days Without End. It won the prestigious Costa Book of the Year prize in January. 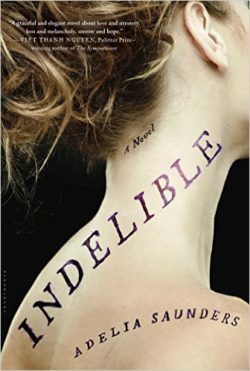 Then, Adelia Saunders discusses her debut novel, Indelible. It’s about a young woman who can read details of people’s lives written on their skin and the father and son whose secrets and searches become intertwined with hers. Classic tropes of the cowboy Western feature John Wayne-type he-men who conquer the Indian savages and sweep pretty women off their feet. It is the classic myth of the American identity in all it’s racist and macho glorification. 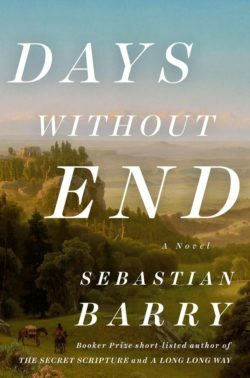 But Irish writer Sebastian Barry paints a different portrait of the Old West in his acclaimed new novel Days Without End, one that traverses the socially accepted notions of the 19th century frontier about identity, justice and gender. The tale is told from the point of view of a poor Irish immigrant, Thomas McNulty, who escapes famine in his own land to become a soldier, first in the Indian Wars and then the Civil War. McNulty’s companion throughout is his lover and brother-in-arms John Cole. The two of them, both orphans, participate in the brutal slaughter of Indian families; then they take in a remarkable young girl orphaned by their own actions to make a redemptive family of their own. Barry’s treatment of the relationship between Thomas and John is both matter of fact and tender — and was in part informed by the coming out of his own son as a gay man. Days Without End is at once a story about the human capacity for terrible violence and inhumanity as well as about its capacity for love and compassion, all told in Barry’s exuberant and poetic voice. Sebastian Barry, considered one of Ireland’s finest writers, is a playwright, novelist and poet. He has twice been shortlisted for the Man Booker Prize for his novels A Long Long Way (2005) and The Secret Scripture (2008). What if you could read the truth about a person written on their skin? Would it be a gift — or a curse? Would you tell what you see — or would you keep it secret? That’s the idea that lies at the center of Adelia Saunders’ terrific debut novel, Indelible. It traces three intersecting stories. Magdalena, a young woman from eastern Europe, can read the details of a person’s life on their skin. She meets Neil, a young American scholar studying in the Paris archives who carries Magdalena’s name on his cheek. And, unbeknownst to them, Neil’s father is also consulting the archives in Paris, on the trail to uncover the truth about the mother who abandoned him. Saunders tells her story with deft precision to her plot and exploration of character. Indelible is a real page-turner with a totally satisfying ending.